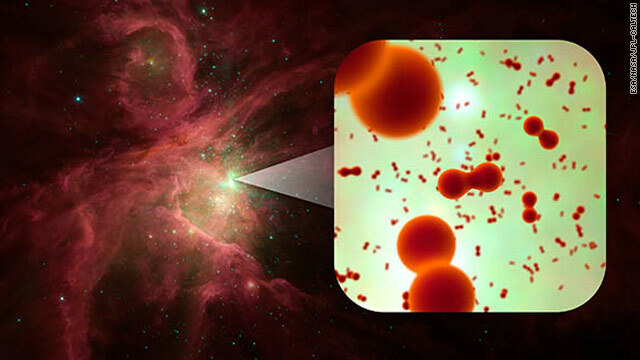 Scientists at the Herschel Space Observatory in Pasadena, California, have found oxygen– in space. Using the facility’s large telescope and state-of-the-art infrared detectors, the European Space Agency project has provided the first confirmed findings of oxygen molecules in space. Individual atoms have been allegedly spotted before, but the breathable molecular form of oxygen has never been seen before. “Oxygen gas was discovered in the 1770s, but it's taken us more than 230 years to finally say with certainty that this very simple molecule exists in space,” said project scientist, Paul Goldsmith, according to the Herschel press release. Astronomers have been searching for the molecule for decades, using everything from scientific balloons to space based telescopes, and thought they found it in 2007, when the Swedish Odin telescope reported a sighting which ultimately could not be confirmed. The molecules were spotted in the Orion star formation complex, the nearest region of continuing star formation, located on the far side of the Gould’s Belt cloud system, which lies on the edge of the Milky Way. Roughly 3000 light years wide, the system is a region of molecular cloud and young star formation through which our solar system is drifting, first described in 1879 by astronomer Benjamin Gould. Researchers are planning to continue their search for the elusive molecule in other star-forming regions, according to the press release. The team currently suspects that oxygen is trapped within ice that coats dust grains floating in space. Oxygen molecules detected by Herschel were likely formed as starlight warmed such dust particles, melting the ice and yielding extremely small amounts of water, which ultimately may have been converted into oxygen molecules. While this explains where some of the universe’s oxygen might be hiding, said Goldsmith, scientists “still don’t understand what is so special about the spots where [they] find it.” In regions of the Orion nebulae where oxygen was not detected, researches believe the molecules may still be trapped in the icy clouds of dust. What about all those "Earth Like" planets they keep telling us about. Don't those planets have free O2 in their atmospheres? If not, they should not be called "Earth Like" (but instead "Mercury Like" or "Mars Like"). If oxygen in space comes near any heat ..........pow !! and gone .................as for life on Mars ? ......Well once the Earth was too hot and at that time Mars had a climate .........one day the Sun will become a red Giant and the Earth will be too Hot again !! ........................and Mars might be the place to be eh ? ..........but it is for future peeps to sort out !